MIDI OSCQuery Helper (“MOQH” from now on) adds OSC and OSCQuery capabilities to other applications that only support MIDI. This app uses JSON files loaded into it to create an OSC address space. This app runs an OSC query server- this query server publishes the details of the address space. This app runs an OSC server- this server listens on a dedicated port for OSC messages. Clients browsing the OSC query server send OSC messages to this OSC server. This app creates a virtual MIDI device (“From MIDI OSCQuery Helper”). This app also lets you optionally pick an existing MIDI device. The OSC messages received by this app’s OSC server are converted into MIDI messages (using data from the JSON file you loaded), and these MIDI messages are sent out both the virtual MIDI device created by this app as well as the existing MIDI device you selected (if any). The MIDI OSCQuery Helper application can also be found on the VDMX dmg in the Extras folder. Tell MOQH what file to use- this file will be used to populate the OSC query server with the description of another application’s OSC address space. MOQH will “watch” the file and if it is updated, the query server will automatically update itself, and then notify all connected clients that it has been updated. For more information about the supported file type(s), see “FILE TYPE”. Select a MIDI destination you want this app to send MIDI data to. This step is optional- MOQH also creates a virtual MIDI device (“From MIDI OSCQuery Helper”) which other applications can listen to. 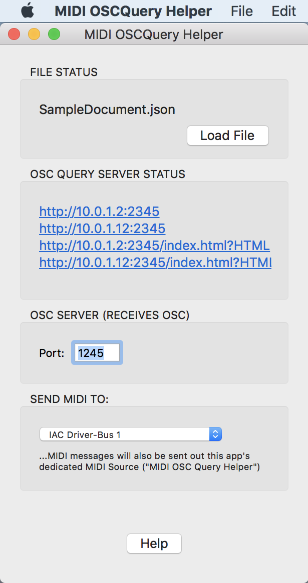 If MOQH is running, the OSC query server is running- you can check it with any OSC query client, or a web browser. The query server will stop when the app quits- if there’s a problem with the file you load (if it’s missing or malformed or corrupt) the query server will keep running, but its address space will be empty. “MIDI_TYPE”: The value stored at the key “MIDI_TYPE” must be one of the following strings: “NOTE”, “AFTERTOUCH”, “CC”, “PGM”, or “PITCH”. This value indicates what kind of MIDI message should be sent when an OSC message is received by this node. “MIDI_CHANNEL”: The value stored at the key “MIDI_CHANNEL” must be an integer. This value describes the channel on which the MIDI message will be sent. “MIDI_VOICE”: The value stored at the key “MIDI_VOICE” must be an integer. This value describes which controller or note will be used to send the value from the OSC message. MOQH only supports receiving of OSC messages and sending of MIDI messages. Bi-directional communication is not currently supported.